This easy to use kit includes everything you need to start flower or vegetable seedlings, propagate fresh cuttings, or grow fresh herbs right in your kitchen all year long. The SunBlasterÂ? 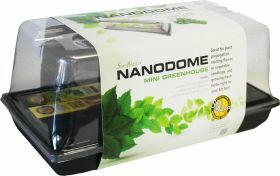 NanoDome is made exclusively for SunBlaster T5HO Combo's and LED Strip Lights, with a unique H pattern which enables you to lay your lighting across a single dome or multiple domes. Kit includes heavy duty 1020 tray, 7" vented NanoDome, and SunBlaster 18" T5HO 6400K Combo lighting kit.